In the carefree time of my youth, I did many things that would be considered quite dangerous these days. To name a few such things, there was swimming with my friends unsupervised, diving off the jetty of Oak Bluffs without a life guard, riding a bike without a helmet and cutting up bait with my pocketknife, which I always carried. I was referring to always carrying the knife, not the bait. Then there were the rockets. Now, I'm not talking about fireworks or bottle rockets, although my friends and I would occasionally get our hands on those, too. No, I'm talking about something a little more high tech. It started, as so many things in my life did, with a present. I think it was from my brother, Steve, but I'm not sure. Anyway, it was a model rocket, which meant I had to put it together. Putting it together was fine by me. I loved models and this one looked cool, judging by the picture on the cover. The packaging screamed its name, the "Bandit" and, now that I think of it, it wouldn't be PC these days. It had a decal for the tail that was the absolute stereotype Mexican bandit. Yeah, it was not nice, but okay in those olden days. Anyway, I attached the snub little wings and tail, put the cockpit and hatch in place, then inserted the crepe paper into the nosecone and popped in the nose. I was a bit surprised that it didn’t have a parachute. My brother David, who had shot off a fair number of rockets himself, explained that with the smaller ones, like the Bandit, they didn’t need one. They were so light that they just floated down to the ground and the crepe paper, which was bright red, was more of a marker, a sort of red flag, of a sort, which would help me keep an eye on where it landed. Finally, I painted the hull bright green and red, and attached the decals. Overall, it was quite the good effort, especially for my first try. I became hooked on rockets. I checked out magazines on rockets, got a couple others that were bigger and fancier, one was even multi-stage, and longed to launch them. The problem was a simple one: location. Living in Arlington, Massachusetts, a suburb of Boston, meant there weren’t many venues available for firing a rocket. The park down the street seemed a possibility, but we checked; the neighbouring houses were too close and the owners might complain. Thus, my collection of rockets sat on the shelf, until summer came. At that time, my brother, Greg, had a place out in the woods of West Tisbury, on Martha’s Vineyard. It was a nice little house. He built with his own hands. He and his wife, Anne, alone with their kids lived there. They had a garden and chickens and it was a cool place. He also had no neighbours. That summer, when we headed to our cottage in Oak Bluffs, also on Martha’s Vineyard, I brought my rockets. I also had something else. I had a rocket launcher. Brother David cobbled together a firing system for me. There were cables, a safety switch, a flashing red light. There was, of course, big red button. One afternoon, while out for a cookout at Greg’s, we set things up. There was the “launch gantry,” which is a metal base with a long tall metal rod to help guide the rocket in its initial ascent. We slid the rocket into place, set the solid rocket engine inside it and then Greg placed the all-important firing pin inside. He then took care of the wiring and we positioned ourselves as far from the gantry as the cables would allow. I flipped the safety up, hit the switch underneath and a moment later the red light started to blink. It was then that I could do “it,” the countdown. Starting at ten, I went to zero and pushed the button. The rocket shot skyward. We watched it go. It climbed high into the clear blue sky. As the apple for Newton. As the engine fizzled out, the rocket slowed and arced above us; then there was a pop as the nose flew off. The red crepe fluttered and the, as the engine’s force was insufficient to allow the rocket to escape Earth’s gravity, Newtonian Physics kicked in. As did the apple for Newton, my rocket plunged downward. I retrieved it in triumph. I felt like Neil Armstrong returning from the moon. 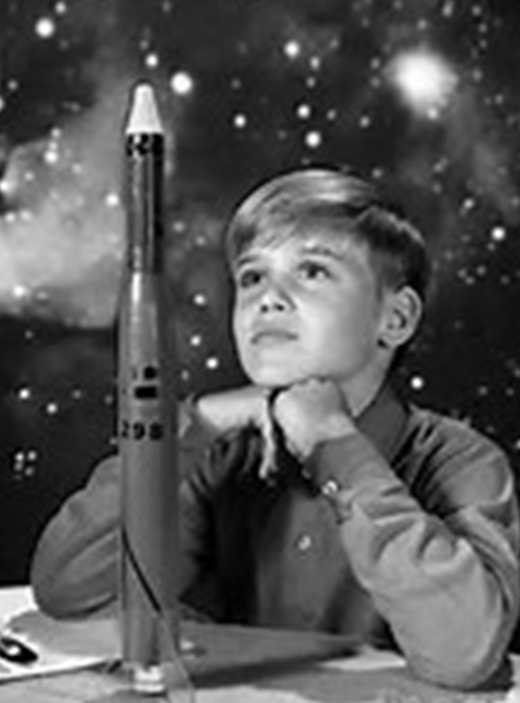 Yeah, the rocket launch was quite the delight for a young boy. It was a great memory to cherish, made all the more wonderful by virtue of the fact that my brothers contributed to the event.